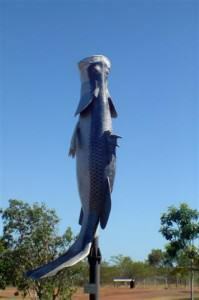 Karumba, on the Gulf of Carpentaria, is one of those places that anyone with a yen for fishing just has to visit. It’s a long way from anywhere but I’m reliably told (by my other half)) that it’s worth it. The Burke Developmental Road, also known as the Matilda Highway, is a long, lonely stretch of road with precious little to break the monotony. It was almost a relief when we arrived in the tiny village of Quamby and although we didn’t stop there, at least we had something else to look at, if only for a few moments. We’d driven about 180 kilometres (112 miles) when we arrived at the Burke & Wills Roadhouse and decided to stop for a coffee. Named for the ill-fated expedition that first crossed the Australian continent from south to north in 1860-61, the roadhouse is a most welcome stop on the long journey to the top. If I was finding this particular stretch of road long and boring I can’t begin to imagine what Burke and Wills must have thought of it. The Burke Developmental Road is interesting, to say the least. Sealed all the way, it is, nevertheless, very narrow in parts, and I imagine that passing a vehicle travelling in the opposite direction would be an event all on its own. There were signs advising travellers that road trains used this road; now that would have been really interesting! our lunch stop in Normanton we stopped beside the Norman River, close to the Normanton Wetlands. Normally this would be an idyllic place to stop for lunch but the overcast and the fact that the river was terribly muddy from recent rains made it all appear in shades of grey. John was fascinated with the river and wandered down for a closer look, taking care to keep watch for the ever-present threat of estuarine (saltwater) crocodiles that inhabit this area. I told him to take particular care; he might be a tasty morsel but he’s my tasty morsel and not for some hungry crocodile. Normanton is about 70 kilometres (42 miles) from Karumba so we knew we didn’t have far to go. It started to rain while we were having lunch, not heavy but enough to annoy and continued to sprinkle for the last leg of the journey into Karumba. We checked in to the Karumba Point Tourist Park ([star][star][star][star_half]) and I certainly didn’t relish a wet few days in a town where, if you’re not into fishing, there isn’t a heck of a lot to do but the rain was all but stopped by the time we had our camp set up although the clouds remained. We drove into town to see what was what and discovered an unimpressive little town that looks like it’s simply been thrown together, and haphazardly at that. 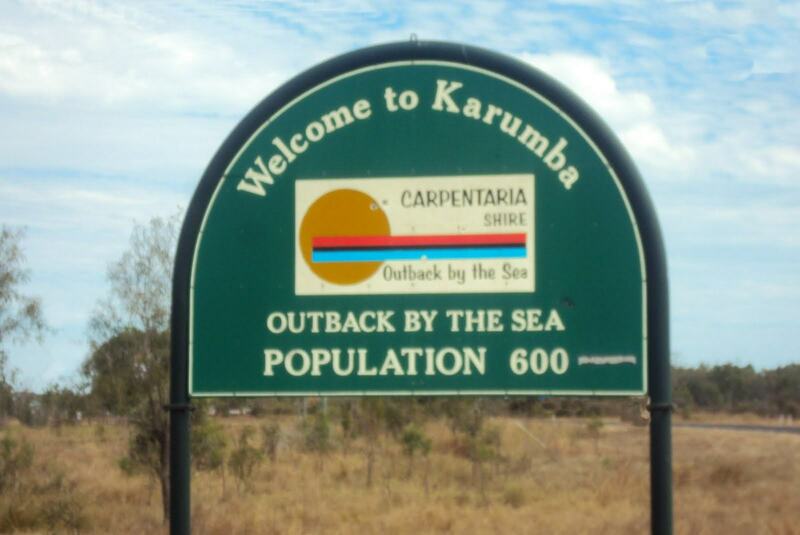 A sign on the main road that just about sums it up: “Welcome to Karumba – population small”. But there is something enticing about the place, especially if you’re an angler. It’s exotic but laid-back, a welcome retreat with a frontier style atmosphere. They say that one deep breath of the air here and Karumba gets into your blood. That probably explains why some people come back year after year. 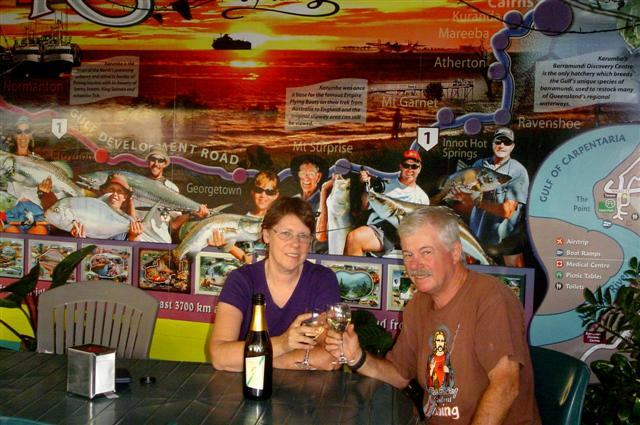 We went into the town to Ash’s Café for a fish and chip dinner that first night and took our bottle of Two Tails Sparkling Wine with us to celebrate a first night in Karumba. John, especially, was excited to be here and was looking forward to some great fishing. The next day was one of those days with nothing planned and nothing much to do, other than a little housekeeping, and it gave us a chance to recharge our batteries, so to speak. It seemed to me that we’d been going almost constantly since leaving home over a month ago and it was time for a break. 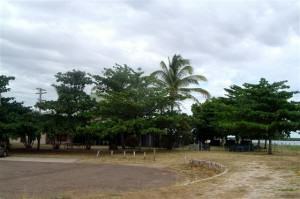 As I said before, there’s not a lot to do in Karumba except relax and that was what I wanted to do. 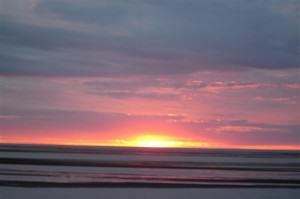 John went down to the beach to do some fishing – with the usual results I might add – but just sitting on the beach in the peace and quiet, watching the water in the beautiful Gulf of Carpentaria, did wonders for him. He came back, if not quite a new man, at least refreshed. It’s reasonably safe to fish from the beach at this time of the year but I imagine it wouldn’t be a terribly smart thing to do in the wet season, given the saltwater crocodiles. The only downside was the overcast; we were hoping the clouds would clear but they were being perverse! Karumba, popularly known as the Outback by the Sea, is the only port on the Gulf of Carpentaria. It was first established as a telegraph station in the 1870’s and is home to an amazing array of wildlife, not the least of which is the saltwater crocodiles that are so abundant in the Top End. In the 1960’s and 1970’s the town became the centre for the Gulf fishing industry and today that industry, most notably prawn (shrimp) and barramundi fishing, earns over AUD$130 million a year. The fishing industry is all-pervading, even the police station has a boat outside it! Did the croc order a beer? 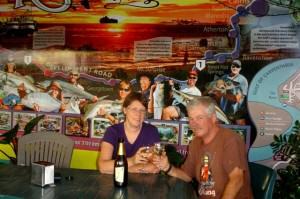 Late this afternoon we drove down to the Sunset Tavern, a very well known Karumba watering hole. Overlooking the water, it is a perfect spot to enjoy a drink and escape from the heat. We weren’t the only ones who thought it was perfect, though. 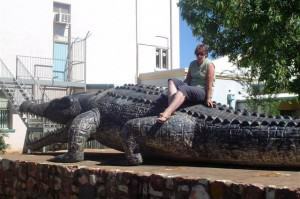 The locals were telling us about a visit from a huge saltwater crocodile last summer. Apparently it made itself comfortable on the veranda and it took the Parks and Wildlife people quite some time to get it to leave! Not really the sort of thing you can shoo away with a broom, is it! After that we wandered over to the boat ramp at Karumba Point where we had a truly magnificent view out over the Gulf. The water seemed to stretch endlessly and disappeared over the horizon. We walked along the path through the Wetlands but other than a few rodents and one or two birds it was deserted of animal life. 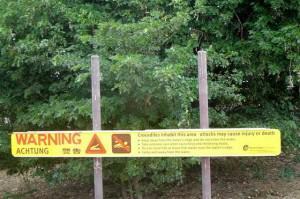 Not that I minded, animal life up here could be a snake or a crocodile just as easily as a kangaroo or brolga! then we were on our way out into the Gulf. Our skipper, Robert, has been operating a fishing charter service at Karumba for over 12 years so it stands to reason that he would know all the best spots to drop anchor. He did tell us, though, that we were a bit late for barramundi. They don’t like the cooler water very much and now that the water temperature was dropping with the coming winter our chances of catching one were approximately zero. But he did promise lots of other fish. There were other folks on board the boat with us and as soon as we stopped lines were cast and everyone settled down for a good days fishing. Well, the fishing wasn’t as good as we expected or were led to believe but it was better than Darwin. John caught the first fish, a nice big blue-nosed salmon, and over the course of the next 5 hours, there was a constant stream of fish being hauled in. Unfortunately most of them were catfish. 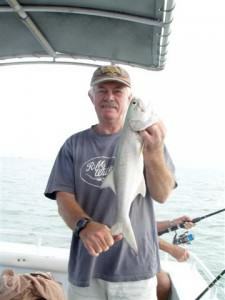 We did, however, catch a lot of the fish they call the skippy, kind of like a Moreton Bay tailor, a couple of small black-tipped sharks, several more salmon, and one very deadly and extremely unhappy sea snake. The snake was returned to the water post haste and we ended up with enough fish to take care of our dinner table for several nights. Not bad for a morning’s fishing. The overcast skies were still with us and the wind was ripping through during the night but seemed to ease off about late morning. We wandered down into the town to have a look at the Barramundi Discovery Centre, the only hatchery in the world that breeds the Gulf strain of barramundi. Fish hatcheries are not my cup of tea and so I left the guys to it and went for a walk around the shops. Not that there was much to see but I needed the exercise. This evening we set off on the Croc n Crab Sunset Cruise. Well, we didn’t see a croc, the only crab we saw was a dead one inside an abandoned crab pot, and the overcast almost took care of the sunset. However we still had a fantastic time. The food, such as it was, was terrific, the wine and beer flowed freely, our fellow passengers were a great bunch of people, and Mark and Julieanne, the owners/hosts were great. The food was not bad; we had a fish dish that had way too much vinegar for my liking but the others seemed to enjoy it, Gulf prawns of which there simply weren’t enough, and a tropical fruit platter. The clouds cleared slightly so that we were able to get some photos of the sunset but mostly the overcast seemed to be determined to stay. That was the only disappointing thing about the whole cruise which lasted 2 hours. It was dark when we got back and with little else to do we made our way back to camp. We’d had a fantastic time and left the boat with some souvenir wine glasses and a promise to return some day. As close as I ever want to get to the real thing! street it was impossible to miss the Krys Savannah-King monument. This is a life-sized model of the largest crocodile ever caught. At 8.63 metres (28 feet 4 inches) long and with a girth of 4 metres (13 feet), it truly was a monster. It was shot on the Macarthur Bank of the Norman River, downstream from Normanton, in 1957 by Krystina Pawlowski, a professional crocodile hunter, and it is estimated that the creature weighed over 2 tons. The model is located in the LEW Henry Park, near the Council Chambers and I couldn’t resist climbing onto the back of it. It’s the closest I ever want to get to the real thing! town. We stopped long enough for fuel and a few photographs before we were back on the road and heading south. The road was littered with the carcases of dead kangaroos and wild pigs, victims of the night and fast moving vehicles, and we saw a lot of snakes, both dead and alive. We had heard at Karumba that this was the time when the snakes are on the move and judging by the number we saw, I’d have to agree. We stopped just north of Burke and Wills Roadhouse in a roadside rest area for lunch, taking our time over the break. There was some traffic heading north and we were pleased that we’d decided to make the trip early in the “season”; I had a feeling that the accommodation and campsites would be filling up fast now. As the tourist brochures proclaim, Karumba is a recreational fishing mecca. 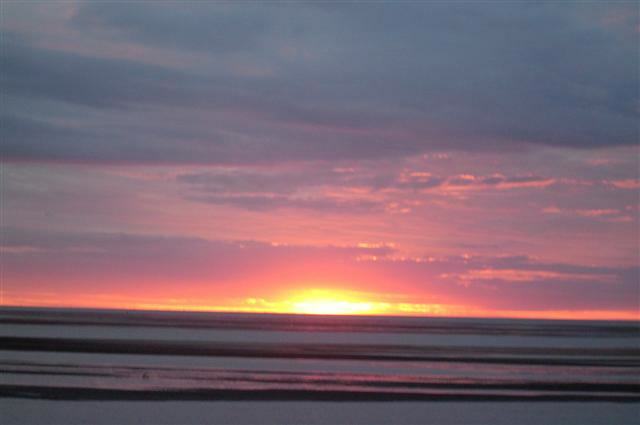 The Gulf of Carpentaria with its azure blue waters is at its most magnificent at sunset. And that’s only two of the many reasons to make the long trek to this stunning piece of paradise.